A good hot or cold shower can be extremely beneficial to your overall physical and mental health! Jumping in the shower and washing away the day’s stresses is something that many individuals enjoy and cherish. Of course, showers and baths have changed dramatically over the years. The shared baths of the Romans are no more. Now, it is possible to shower in your own home and utilize the hand held shower heads to control the water’s flow. With this type of showerhead, you will be able to direct the water wherever you wish it to go. Some of these handheld showerheads are better than others. Finding the right one is essential and the information presented below will help you identify the best handheld shower head for your specific needs. When attempting to purchase a brand new hand held showerhead, you will want to take your time and evaluate each and every one of your options. Each homeowner is different and their unique desires will vary widely. Below, you’ll find a handful of factors to take into account, when attempting to locate the best hand held showerhead for your bathroom. First and foremost, you will want to examine the overall cost of your showerhead. The good news is that there is an abundance of options to choose from and the prices will vary incredibly. Therefore, if you want to spend very little, you can. However, you shouldn’t be afraid of spending extra, because doing so will usually deliver a better product. 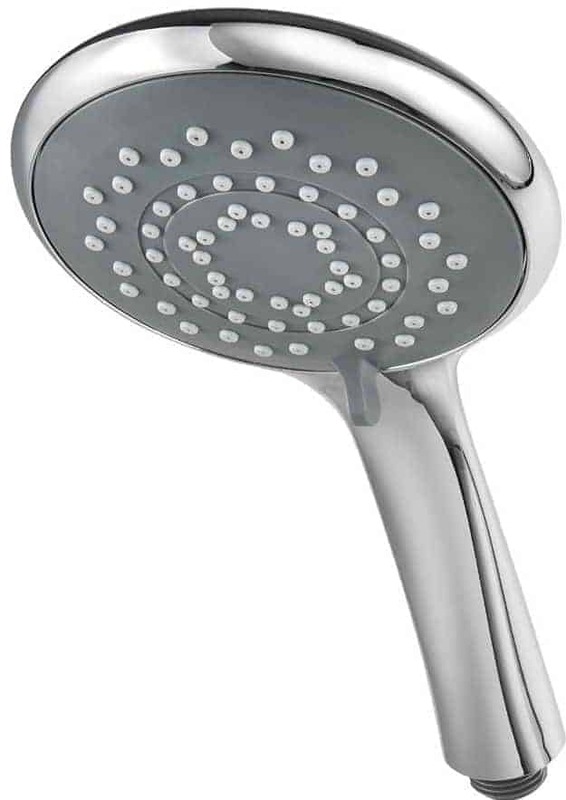 The majority of hand held showerheads would come with some degree of adjustability. Usually, more expensive models will have a much more diverse array of spray settings. These could include jet, spray, rain, blast, and drench. If you wish to gain access to each and every one of these options, you may need to spend a little extra. If you’re the type of individual, who jumps in the shower and rushes the process, this might not be so important. If you wish to save money, you should consider spending a little extra and making the upgrade to a showerhead, which is economic friendly. These models are capable of saving water, by restricting water flow. This doesn’t mean that you won’t receive sufficient pressure, because you will. In fact, you’ll receive plenty of pressure and will save money on your water bill. 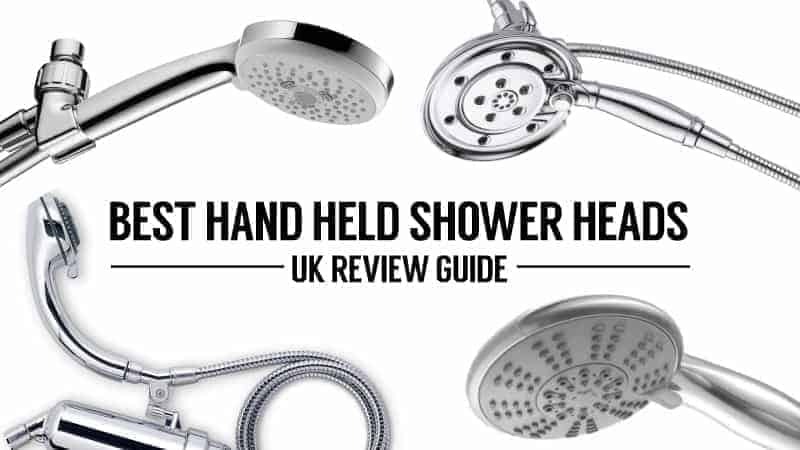 Read our guide to the best water saving showerheads here. Some consumers desire a shower, which is going to work their muscles and relieve their stress. If you fit into this category and want to eliminate your soreness, you may want to invest in a showerhead, which is equipped with a massage setting. This particular mode will shoot out the water in a manner, which closely replicates a full body massage. Suffice to say, if you want a totally relaxing, luxurious shower, you’ll want a showerhead that features this setting. In terms of your showerhead’s beauty and durability, the material used in its manufacture is integral. The material will also help to determine how difficult the showerhead will be to clean and restore. Although a better material will definitely be a little more costly, it’ll certainly deliver additional benefits and will be well worth it. Your showerhead needs to last a sufficient amount of time, even if you spend very little. This is why it is a good idea to invest in a lengthier warranty. The warranty will protect you in the event of anything going awry. In this category, longer is always better, even if you must pay a little extra to get it. Maintaining a hand held showerhead can be a little more difficult than you could imagine. Of course, some models are actually resistant to lime scale and other problems. Opting for one of these models is a good ideal, if you desire additional convenience and want to spend less time cleaning! One of the most important factors to consider is the hose length. If the hose isn’t long enough, you’ll have a difficult time using it comfortably. Be sure to consider your height and make sure that the hose will give you the ability to easily wash your entire body, without much trouble or too much flipping around in the shower. When attempting to find a good showerhead, you should always check out the unit’s LPM rating. This will help you figure out how much pressure that the specific showerhead will be able to deliver. Obviously, if you want more pressure, you’ll want to choose a showerhead with a higher LPM and vice versa. All in all, there are numerous things to take into account, when attempting to choose an excellent showerhead for your own individualistic preferences. The most important factors have been explored above. Now, it is time to check out the best hand held showerheads on the market. Taking a shower can be a magical thing. This is a time when you get to relax and just soak up the hot water. However, if you do not have the right showerhead, you might not get as much pleasure. With that being said, there are so many different showerheads on the market, how do you know a good one, when you see it? 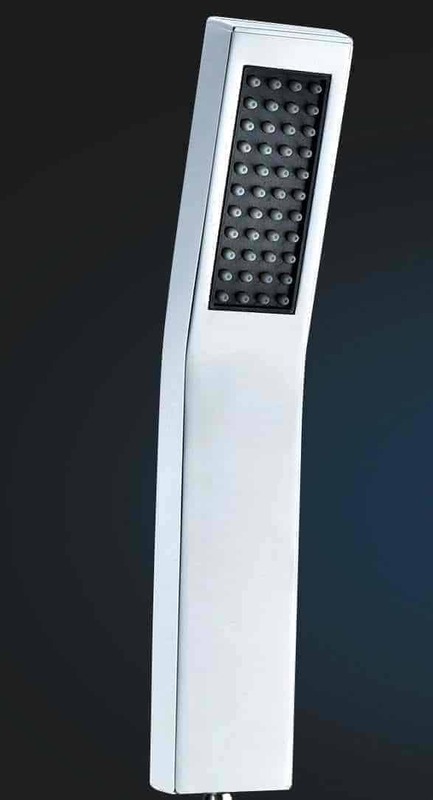 Well, take a look at the Triton 5 Position Showerhead. The best thing about this showerhead is that it is compatible with just about every type of shower including mixer showers, electric showers, and a bath/shower mixture. The showerhead offers 5 different spray patterns to choose from. You can choose one to suit the mood you are in. You have the option of choosing from blast, spray, drench, jet, and rain. Maintenance is a simple task with this product, because it is constructed of plastic that reduces the chances of lime scale build up. On top of all of this upon the purchase of this product you will receive a 1-year parts and labor warranty. It is easy to find a few likeable things about this product, but the pros and cons will be listed below. 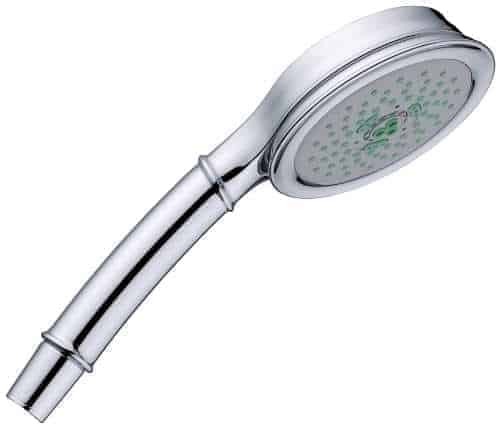 At the end of the day this is truly a great showerhead that will replace any household shower. It also has a solid construction and beautiful, bright finish. Q: What is the water flow rate of this shower head? A: we have a Triton Elec shower with winter (2 heater bands running) and summer (1 Heater band running) you adjust the flow rate to get the right water temp. On all settings we get a good shower. Are you thinking about remodeling your bathroom or does your showerhead need to be replaced? If so, you should check out the KES P101 showerhead. This very affordable showerhead is constructed of durable materials that will ensure not only comfort, but also longevity. ​When you buy a product, you want it to last and that is just what this amazing product will do. This first notable thing about this showerhead is that it is very affordable, but do not let that fool you, because it is built to stand up to the test of time. The KES P101 is constructed of brass metal, which not only ensures quality, but also durability. The multi-layer chrome finish will help protect against corrosion, scratches, and tarnishing. The showerhead is equipped with a ½ inch connect, which makes it a suitable replacement for just about all-existing showerheads. The standard shower connection is a ½ inch. There are a lot of likeable things about this product, but the most notable will be listed below. You can see that this product has some pros and cons, but at the end of the day the pros far outweigh the cons. Over the years, there have been many different showerheads developed by various manufacturers. Each comes with each advantages and disadvantages. Unfortunately, this makes choosing a showerhead, a very difficult job. That was until you discover the Yakult 100% metal showerhead hit the market. This is truly a great showerhead that can offer any homeowner lots of benefits. To start off, it is extremely affordable and will replace any existing showerhead including power showers, and bath/shower mixtures. This product does not look like a normal showerhead, since it has a sleek L-styled handheld design that is detachable with a 1-1/2 meter stainless steel hose. The L-style design will fit into your hand perfectly, making this showerhead ideal for bath kids, and pets. The Yakult is constructed of lead-free solid brass, which not only protects your skin, but also ensures longevity and quality. This showerhead is built to last. Along with this, the showerhead is coated with a multi-layer chrome finish that fights against corrosion and oxidization. One of the best things about this showerhead is that it can be installed in a matter of minutes. Plus, very few tools are required for installation. As you can see, this is a unique and affordable showerhead that offers any homeowners tons of benefits. It is actually one of the best showerheads on the market. Nothing is more relaxing than take a hot shower. However, not all showerheads offer the same great features. 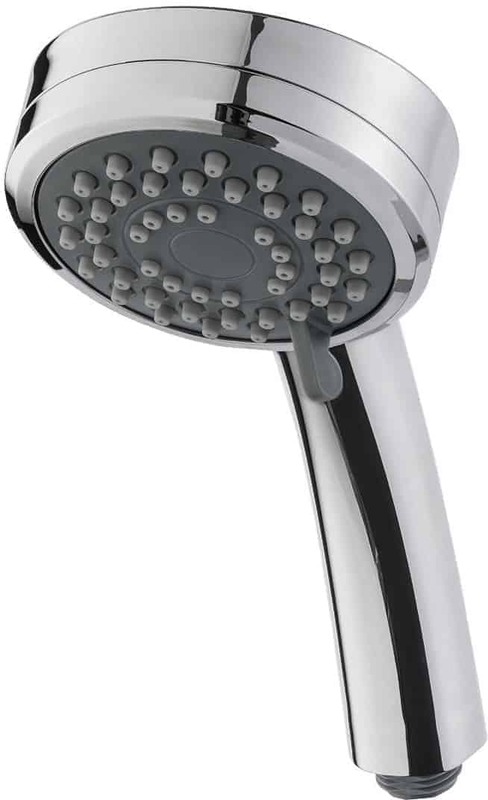 If you are in the market for a new showerhead, you need to take a look at the Ancheer Series AN-SH003. This amazing showerhead cannot only provide extreme comfort, but it can actually help you save water, as well. Below, you will learn more information about this product. This very affordable showerhead has a super-water savings mode that can actually use less water and decrease waste. However, you should not let the low price tag fool you, because this showerhead is very powerful. It can provide you with a spa-like water massage. Imagine coming home to a spa massage every day after work. The showerhead is designed with sleek chrome that not only looks great, but will never fade, even after many years of use. This model offers users with 5 great functions to choose from. On top of all of this, the tap is very easy to clean, because it is constructed of high-grade TRP polymer. One of the best things about this showerhead is that it is compatible with just able all types of existing showerheads, thanks to the ½ inch connector. This showerhead is certainly a great buy that will make a great addition to any bathroom. It has a solid construction, plus it will add glamour to your shower stall. Taking a shower should be a very enjoyable experience. However, if your showerhead just doesn’t do the job, it might be time to replace it. With all the different showerheads on the market, choosing one can be a very difficult task. So, if you are in the market for a replacement showerhead, you need to take a look at the GROHE 27597000 Tempesta. This model was truly designed to provide you with comfort. Below, you will learn more information about this amazing handheld shower sprayer. This showerhead offers two different spray options. You can choose the rain spray, if you are in the mood for a soft summer rain or you can choose the jet spray. The jet spray provides a great massaging effect and offers efficient cleaning. The chrome coating not only protects against scratching, but it is very easy to maintenance and clean. Along with the silicone nozzle cleaning this showerhead will be a snap and take only a matter of minutes. Safety was a big factor that went into the design of this showerhead. The InnerWater guide feature prevents scalding. The best thing about this product is that it comes with a 5-year manufacturer’s warranty. The GROHE 2759700 Tempesta is a product that cannot be overlooked. As you can see, the affordable showerhead really has a lot to offer any household. Those that are looking for an incredibly affordable showerhead, which will definitely withstand the test of time, should look no further than the Triton 3 Position Shower Hea﻿d. This specific model is available in two unique colors, including chrome and white. Both deliver a sleek appearance, which will blend in perfectly in any bathroom. To make this product even more appealing, the manufacturer backs it up with a full 1-year warranty on all parts and labor! Despite the affordability, you can rest assured knowing it’ll last or the manufacturer will fix or replace it. The showerhead is immensely versatile and can truly be used for any and all showers. As the name implies, it comes equipped with 3 individualistic spray options. Once you’ve entered the shower, you can simply turn the nozzle, until you land on the pattern that suits your preferences the best. For additional convenience, the showerhead can be rubbed clean easily. Additional pros and cons can be found below. All in all, the Triton 3 Position Shower Head is an excellent hand held head, which is affordable, stylish and convenient. Despite a few minor cons, the showerhead is an excellent investment for almost everyone. Q: Does the head come apart for cleaning? A: Yes, Instructions for cleaning included. If you’re looking for a much more comprehensive and versatile showerhead, you’ll definitely want to check out the Grohe Power & Soul. The unit is a little more expensive than the rest, but it is well worth the additional cost. It comes with an array of added features, including a larger select of colors. You’ll be able to choose from chrome, clay, granite, limestone, marble, and more. Regardless of your bathroom’s color scheme and style, you can guarantee you’ll be able to find a Grohe Power & Soul that blends in perfectly. Not only is this unit immensely effortless to clean, thanks to the Grohe StarLight chrome coating, but also it is scratch resistant. This guarantees that it’ll maintain its beautiful shine for many years to come. Throw in the manufacturer’s 5-year warranty and this hand shower can last your family and you a lifetime. This showerhead is equipped with 4 jet modes, including Rain Spray. This mode is soft and soothing enough to lull you to sleep. The Bokoma Spray option is great for those that want a good massage. For additional convenience, consumers will be able to utilize the one-click showering feature to jump in the shower and begin with haste. Additional pros and cons can be found below. The Grohe Power & Soul is an excellent showerhead, which is versatile, beautiful and designed to last a lifetime. 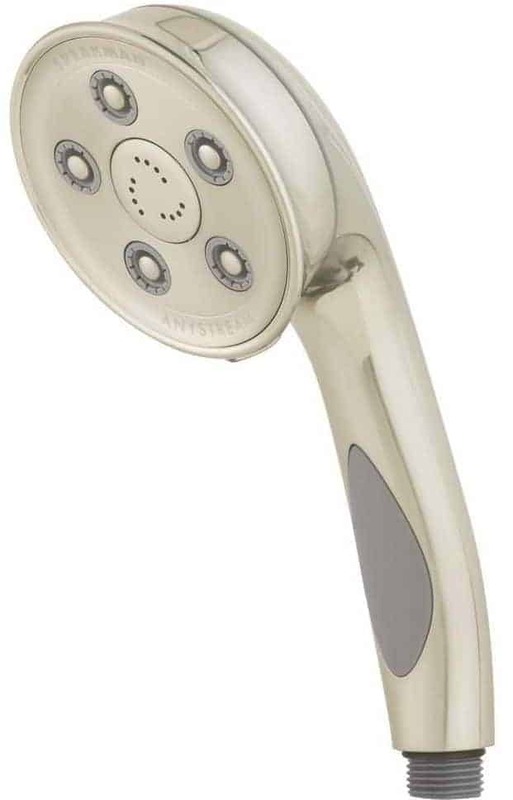 If you’ve got a little extra to spend, you should certainly consider investing in this hand held showerhead! Are you looking to add a little pizzazz to your shower time? If so, you should consider installing a LED showerhead in your bath. This wonderful sprayer will automatically change colors, rotating through 7 different hues. This will offer an illusion that you are skating in an ice rink underneath a strobe light and disco ball. The CrazyFire shower sprayer is constructed out of corrosive-free ABS materials. It has a very solid construction, plus the ergonomically designed handle will fit your hand like a glove. This is not a battery powered shower head, so you never have to worry about replacing expensive batteries. Instead, it relies solely on water pressure to activate the LEDs. It is important to note that this sprayer requires a specific amount of water pressure, in order to display all 7 colors. The installation is extremely easy and only requires replacing the existing showerhead, which should only take 5-10 minutes. Overall, the CrazyFire LED showerhead has a solid construction, which feels good in your hands. It will offer any family many years of colorful, disco lighting entertainment. The market is overflowing with excellent showerheads and the Hansgrohe Raindance is definitely one of the best on the market. Although it is a little more costly than some of the alternatives, it is definitely well worth it. First and foremost, this showerhead is equipped with an incredibly innovative Quick Clean system. This makes it easy for the consumer to wipe the unit clean and wash away lime scale, without any strenuous scrubbing. The showerhead is designed to provide the user with a completely personalized showering experience. First, it offers three pressure settings, which including RanAir, Rain and WhirlAir. Second, the user can access these settings with the touch of a button. This eliminates the need to turn a knob, in order to acquire the precise flow and spray that you desire. The showerhead, which measures in at 120mm, is massive and will be sure to cover a greater portion of your body at once. 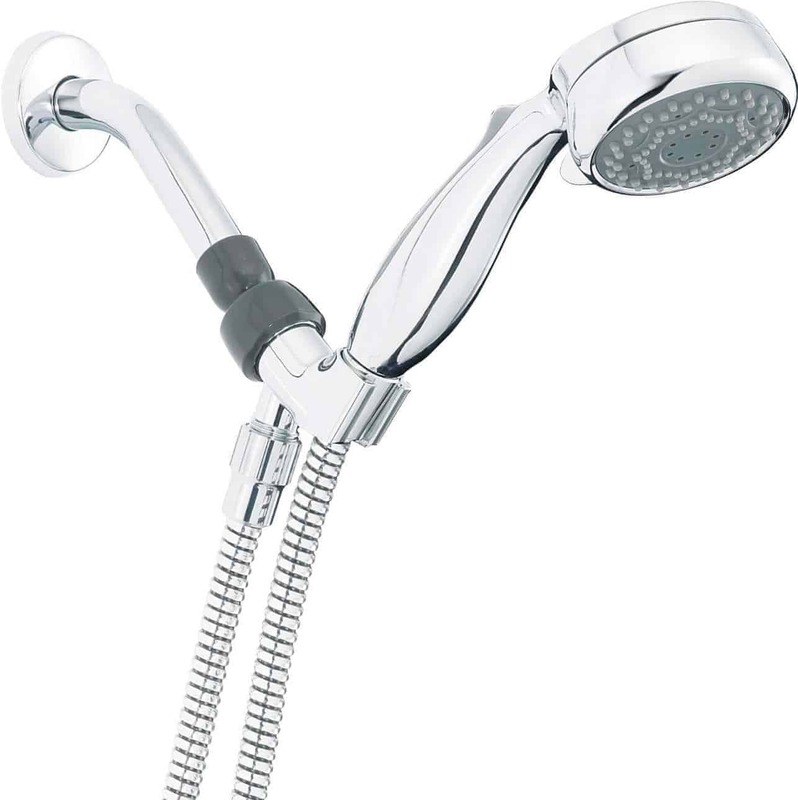 The showerhead offers pressure ratings between 1 bar and 6 bar. Despite the price tag, the Hansgrohe Raindance is an excellent overall value. It is bigger, bolder and much more versatile than many of its competitors. Be sure to check it out for yourself immediately! Everyone loves to take a long, relaxing shower, but this is not possible, if your shower is not equipped with the proper showerhead. Now this does not mean that you need to spend a lot of money on a specific showerhead brand. Instead, you should purchase the DreamSpa® Ultra-Luxury. Do not judge this showerhead, by its low price tag, because it is equipped with everything that you need to receive a luxurious shower. The showerhead is 5” in diameter and equipped with 7 different settings, so you can easily customize the output from a drenching rain to a warm mist. The handle is equipped with a pause feature, so you can simply halt the water flow, during use, without needing to turn the water tap off. This is a wonderful feature, since it offers convenience, but it also helps to save water wastes. 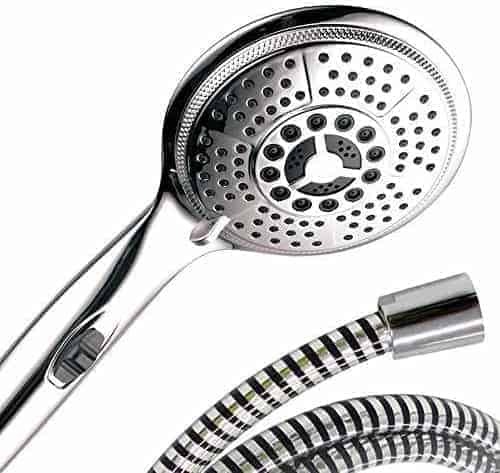 The showerhead is adjustable, which is great for those that are very short or tall. The hard plastic has a chrome finish, which will be suitable for all showers and be a great addition to your bathroom décor. The installation is very easy and takes around 20-30 minutes tops, even for the unskilled individual. You will receive all of the installation supplies, in the package deal, which will also save your some money and time. 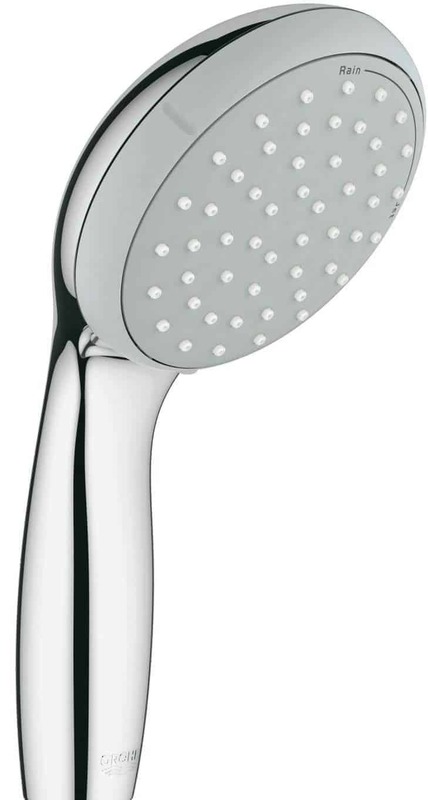 The DreamSpa ® Ultra-Luxury is a very durable showerhead that will offer a long service life. 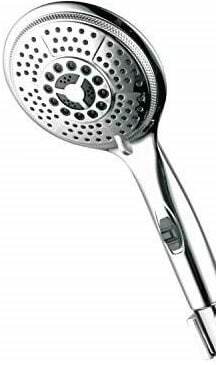 If you are looking for a inexpensive showerhead that will offer longevity, look no further than the DreamSpa ®. Some consumes are interested in splurging and spending more! It is vital to remember that you get what you pay for. With the Speakman VS-3014 Caspian Anysteam, this is entirely true. The product might be significantly more expensive than the others, but it is also much more efficient and offers some excellent features, which more than justify the price! The Anysteam 360 degree technology is great and can deliver a water stream, at great angles. This also offers multiple spray patterns to ensure that you get the precise type of shower that you desire! Also, the installation process is completely effortless. Once you’ve received the package, you will not have to purchase anything separately or additionally. Everything that is required is included. The showerhead has been engineered in a manner, which ensures that it can be installed within a matter of minutes. If you’re not a DIY professional and don’t have many tools, this will not be a problem. The 5-foot metal hose provides the user with extreme flexibility and ease of use. This should be more than sufficient for most bathrooms. Again, this specific showerhead might be a little more costly, but it comes with some excellent features! The lifetime warranty ensures that you will never have to purchase another showerhead ever again. The installation is easy enough and everything is included. With various settings, you will be able to experience the precise shower that you desire! If you are looking for a showerhead that has a unique design and capable of giving you that luxurious shower to die for, you should consider the Hansgrohe 04072000. The unique showerhead will look great in any shower and be a great addition to any bathroom décor. The showerhead is equipped with 75 spray channels that are designed to not prevent clogging, which can occur from harsh water and carbon buildup. Do not worry if your bathroom is equipped with bronze or nickel, because the Hansgrohe is available innumerable finish. Whether you like a full or an intensive turbo spray, you will find that the Croma C 100 will offer these modes, along with a massage spray, so you can easily adjust your shower. The handshower is very durable and will offer convenience, since you can use it for an overhead shower or a body sprayer. This is great for those that like to feel the spray all over their body. The Hansgrohe will offer the perfect water flow, along with a massage spray, so you can easily wash away those sore muscles, while you are relaxing in your shower. The larger face will offer a wider spray, which is very desirable for most. You must be aware of what is included in the package, when you are purchasing the Hansgrohe. You will only receive the showerhead, without the hose and connector, but overall you will be highly satisfied with your purchase. Some individuals want to be able to benefit from a handheld showerhead, but they do not want to spend lavishly. By purchasing the showerhead from Niagara Conversation, this is completely possible. This specific product is significantly cheaper and will be able to save you money in two individual ways. Since the product is designed to utilize much less water than others, you will save a tremendously amount of money on your water bill, as well. When compared to other similar products, this one will use 20% less water. Although this might not seem like a lot, it will reflect significantly on your water bill. Of course, the information above shouldn’t confuse you into believing that this showerhead will provide lessened water flow. It doesn’t! It is specifically designed to be able to provide you with great water force, despite the low pressure. The product is fitted with a 72-inch hose, which will never tangle. 72 inches should be plenty for all consumers. If you’re worried about the installation process, you shouldn’t be. It can installed, without any complicated steps or tools. In fact, it can easily be used with all standard showerhead arms. Overall, this particular shower head is a wonderful choice for many consumers. It is affordable, easy to install and will help you save even more money than others. A 10-year guarantee is also provided, so you will be able to maintain your confidence in your purchase. The showerhead is definitely worth the money and better than most. There is no doubt that Delta has been around for an extensive period of time. The company is well known for their faucets and showerheads. The Delta 75700WH follows suit, by delivering an excellent product that is affordable, but well rounded and worth exploring further. The product offers a longer hose than some of the others. 6-foot will undoubtedly serve most significantly well. The hose is flexible and never tangles. The installation is a little more time consuming and a wrench and pliers will be required, but most individuals already own these simple hand tools. The product is effortless to use. It is equipped with an easy to turn spray dial, which allows you to adjust the showerhead’s spray, without hesitation. An energy-saving spray setting is available, if you wish to reduce the water usage. This can be exceptionally helpful, if you wish to cut back on your water bill. Take note that this showerhead is available in two styles, white and chrome. Both are beautiful and work excellently. Although the price is low, you shouldn’t judge a book, by its exterior. This one is well worth checking out and greatly exceeds the expectations given to it. There are innumerable handheld shower heads on the market, but some of them aren’t worth your money. By analyzing all of the specifications associated with each of these products, you will be able to find the one that will work best for your specific desires. Above, you have been able to find a look at some of the best handheld shower heads on the market. Be sure to take the information into account, when making your decision.